When it comes right down to it, most cameras manufactured in the last few years (really anything 16 megapixels and up) are capable of printing billboard-size prints. However, if you want the ultimate in print quality perfection, then there are limits to how big you can print before you start to lose a small amount of print quality. Note about the chart above! PLEASE NOTE: A yellow check mark on the chart above does NOT mean the print quality will be bad… AT ALL. It only means that it won't be the PERFECT magnifying-glass pixel-peeper perfect image quality at that size. Don't stress it. Even a few of the red X's could be ignored if you take viewing distance into account. A very common resolution for printing an ad on a very large outdoor billboard is 1800 pixels on the long edge and 1200 pixels in height (about 15 dpi). That equates to a mere 2.1 megapixels. Sound crazy? Well, it's actually not. And understanding this principle will help you to be able to print at much larger sizes than you think you probably can. The secret is that as print size increases, so to does viewing distance! If you were to stand right up in front of a billboard, you'd clearly see that the resolution is AWEFUL and the print looks pixelated. But nobody stands with their nose to a billboard. We see them from far away. The same thing happens on a smaller scale with prints. When you print an 8×10″ print, it's likely that someone will hold it an arm's length away from their face. So we need a resolution that will be as fine as our eyes can resolve (and the printer can pull off) at that distance. But when you print very large (like a 24×36″ print), no one would stand that close to it. Since the viewing distance is further, the print resolution does not need to be as fine. So the first question you have to ask yourself when determining how large you can print is, “What will the viewing distance be?” But don't worry, we don't need any complicated math and you don't need to measure anything. Just realize that bigger prints mean longer viewing distance, and that's why I said in the opening sentence that almost all modern cameras can produce a good quality print of any size. In the chart on this page, where I mark “Perfect” as the print quality, I mean 300ppi. That isn't to say that some printers can't print at a higher resolution than 300 dpi, but that the difference becomes scientific after 300 ppi. It takes an impressive eye to be able to tell the difference in a print between 300 and 400 dpi–and probably a loupe would be necessary. The gold standard in printing is usually regarded as 300 ppi. But that's completely different in printing compared to viewing an image on screen. When you're saving a picture in Photoshop and it asks you the resolution, that box is COMPLETELY irrelevant if you'll be showing the image on a screen (internet, Facebook, email, etc). You could put 1 in that box or 2,000 in that box and it won't make a lick of difference. https://improvephotography.com/ppi-test/ Why? Because the screen's resolution sets the resolution! Put whatever number you want in that box and you'll see the file size stays exactly the same. All that matters when you're putting an image on a screen or sharing it on the web is the overall pixels wide and high. In the chart, I show you how big you can enlarge your print to get perfect, 300ppi print quality. 300ppi print resolutions are marked with green check marks in the chart. However, remember what I mentioned previously, that this really only matters when you're inspecting the print under a magnifying glass. In reality, as the photo gets larger, the viewing distance scoots back. But if you want the ULTIMATE print quality, this is a handy guide. But remember that the difference between a green and a yellow checkmark on the chart above is mostly scientific. More on that below. On the guide at the top of the page, I marked with a yellow check mark all of the print sizes that I'd feel completely confident in printing. I've printed at all of these resolutions with cameras at most of these resolutions. You'll be surprised at the quality and detail you'll see in a “yellow check mark” print. 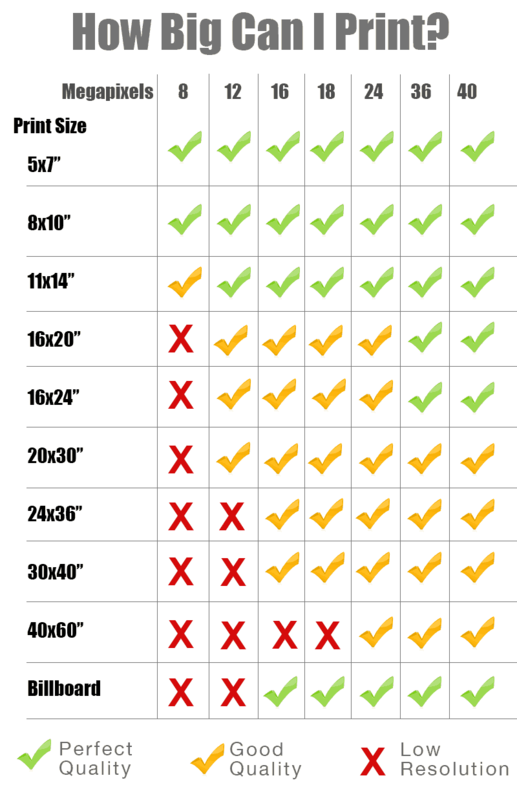 In fact, the difference between the yellow and green check mark sizes is so tiny that most photographers couldn't dream of telling the difference with a naked eye at the proper viewing distance (without putting your nose up to the print and squinting through a magnifying glass, for example). Sometimes you want to print big, but you may not have a camera with enough megapixels. In those instances, here are some handy tips that have helped me to print HUGE prints even on lower resolution cameras. Shoot a panorama – When you shoot a panorama, you take multiple pictures and combine them together to produce a wider or taller image. Since you're combining resolution, you have a HUGE resulting file. I use this frequently when shooting landscapes on my 16 megapixel Fuji XT1. If your camera has a high megapixel mode, use it! 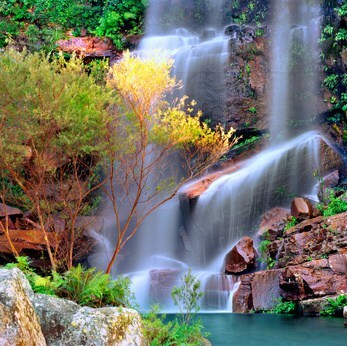 – You may be lucky enough to shoot a camera that has a high megapixel mode. For example, some of the Olympus Micro 4/3 cameras usually shoot 16 megapixels, but can use sensor shift to make a true 40mp file. There are limitations in using something like this when there is motion in the scene, but it produces a fantastic file. Use higher-end programs to resize before uploading to the printer – Whatever you do, don't just upload a low resolution file to the printer. Some printers handle this well, and others do not. Take the time to up-res your lower resolution file in Photoshop and send that to the printer. By doing the up-res yourself, you can add in some of the clarity and contrast that is usually lost when enlarging a photo. Add a texture to the photo – If it works with the artistic goal you have in mind for the picture, you may consider adding a texture to the photo. That masks a lot of the loss of resolution and can be a creative effect. A matte finish can do the same thing. Print on metal, canvas, or matte paper. Avoid glossy paper. – Glossy paper is the most likely to show the lower resolution affecting the print. If you print on metal, you can EASILY get away with a very resolution picture, because the inks smear on the metal. Canvas and matte paper are just very slightly better for low resolution when compared to glossy, because the inks bleed just a tiny bit. Conclusion, and an Important Printing Resource! Much more important than the number of megapixels in your camera is the quality of the printer you choose to do your printing. About a year ago I ordered the exact same 3 prints from about 12 different printing companies to compare the prints and to see which company produced the highest quality and least expensive print. I was shocked to find that the cheapest lab produced the best print, and one of the most expensive labs produced the worst print. There's actually a HUGE difference between the labs in terms of print quality. You can read my full print test article here, and keep in mind that NONE of the companies paid me a dime to do the test. It's completely unbiased.